← Srimanth fights cerebral palsy to become Karate Champion. Resul Pookutty hails from the nondescript village of Vilakkupaara at Anchal in Kollam district in Kerala. Being the youngest of eight siblings, Resul did not have much ground to complain against deprivations. He used to walk 6 km to school daily. The Government school where he studied used to provide noon meal and that used to be the major attraction for Resul and many of his friends. Electricity popped into his village when he left there to join the two-year pre-degree course in a college near his father’s ancestral house in nearby Alappuzha district. Cinema was far from mind, and Pookutty tried his hands at many things before straying into the world of celluloid. He reared domestic animals, sold milk, later took tuitions to finance college. For a brief while, he dreamt of becoming a doctor, but gave it up when he failed the medical entrance. After graduation in Physics, he joined the Law College, Thiruvananthapuram. However, even then, say acquaintances, sounds seemed to hold a strong fascination. “During a recent reception at the village, Resul said the chirping of birds and gurgling of the rivulet had always evoked much curiosity in him,” said his brother Baiju. Going to the cinema along with friends was the favorite pastime. It was only out of curiosity and peer pressure that he applied for the sound engineering course at the Pune Film and Television Institute of India (FTII). He failed the first time, returned to Thiruvananthapuram, and read up all the books he could find on sound engineering. In the next entrance examination and group discussion, Pookutty passed. It was his love of physics that made him opt for sound at the Film Institute in Pune. Those were hard times. It was the scholarship at college that helped me sail through without much difficulty”, Resul said before he left for the Oscar award ceremony. Out of college, he worked in Rajat Kapoor’s ‘Private Detective’. A string of films followed. The break came with Sanjay Leela Bansali’s ‘Black’, which was noted for its sound mixing. Looking back, Resul believes even small things life stood out for sheer coincidence. His hostel room in Pune had the poster of Danny Boyle’s film, ‘Trainspotting’. And 12 years later when his phone rang, with Boyle wanting to sign him up for ‘Slumdog..’, the poster flashed in his mind. 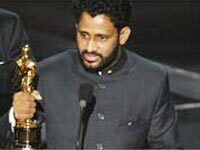 Sound engineer Resul Pookutty became the third Indian to bring Oscar glory for India by winning the award for sound mixing in ‘Slumdog Millionaire’.His regret is both parents are not alive to celebrate his Oscar nomination. He is married to Bebin Shadiya and they have two children-Ryan, three and a half years and Salna, one year. This entry was posted in Uncategorized and tagged Anchal in Kollam district, indian to win oscan for sound, Oscar, oscar award for indian, oscar award for indian films, oscar award for indians, oscar for kerala, Pune Film and Television Institute of India (FTII)., Rajat Kapoor’s 'Private Detective'. Sanjay Leela Bansali’s 'Black', Resul Pookutty, Slumdog Millionaire’, Sound engineer Resul Pookutty. Bookmark the permalink.